Schlieren image of a shotshell projectile exiting a barrel. Colour schlieren image of the thermal plume from a burning candle, disturbed by a breeze from the right. Schlieren photography (from German; singular "Schliere", meaning "streak") is a visual process that is used to photograph the flow of fluids of varying density. Invented by the German physicist August Toepler in 1864 to study supersonic motion, it is widely used in aeronautical engineering to photograph the flow of air around objects. The classical implementation of an optical schlieren system uses light from a single collimated source shining on, or from behind, a target object. Variations in refractive index caused by density gradients in the fluid distort the collimated light beam. This distortion creates a spatial variation in the intensity of the light, which can be visualised directly with a shadowgraph system. In classical schlieren photography, the collimated light is focused with a converging optical element (usually a lens or curved mirror), and a knife edge is placed at the focal point, positioned to block about half the light. In flow of uniform density this will simply make the photograph half as bright. However, in flow with density variations the distorted beam focuses imperfectly, and parts that have been focused in an area covered by the knife edge are blocked. The result is a set of lighter and darker patches corresponding to positive and negative fluid density gradients in the direction normal to the knife edge. When a knife edge is used, the system is generally referred to as a schlieren system, which measures the first derivative of density in the direction of the knife edge. If a knife edge is not used, the system is generally referred to as a shadowgraph system, which measures the second derivative of density. If the fluid flow is uniform, the image will be steady, but any turbulence will cause scintillation, the shimmering effect that can be seen on hot surfaces on a sunny day. To visualise instantaneous density profiles, a short-duration flash (rather than continuous illumination) may be used. In the mid 20th century, R. A. Burton developed an alternative form of schlieren photography, which is now usually called focusing schlieren or lens-and-grid schlieren, based on a suggestion by Hubert Schardin. Focusing schlieren systems generally retain the characteristic knife edge to produce contrast, but instead of using collimated light and a single knife edge, they use an illumination pattern of repeated edges with a focusing imaging system. The basic idea is that the illumination pattern is imaged onto a geometrically congruent cutoff pattern (essentially a multiplicity of knife edges) with focusing optics, while density gradients lying between the illumination pattern and the cutoff pattern are imaged, typically by a camera system. As in classical schlieren, the distortions produce regions of brightening or darkening corresponding to the position and direction of the distortion, because they redirect rays either away from or onto the opaque part of the cutoff pattern. While in classical schlieren, distortions over the whole beam path are visualized equally, in focusing schlieren, only distortions in the object field of the camera are clearly imaged. Distortions away from the object field become blurred, so this technique allows some degree of depth selection. It also has the advantage that a wide variety of illuminated backgrounds can be used, since collimation is not required. This allows construction of projection-based focusing schlieren systems, which are much easier to build and align than classical schlieren systems. The requirement of collimated light in classical schlieren is often a substantial practical barrier for constructing large systems due to the need for the collimating optic to be the same size as the field of view. Focusing schlieren systems can use compact optics with a large background illumination pattern, which is particularly easy to produce with a projection system. For systems with large demagnification, the illumination pattern needs to be around twice larger than the field of view to allow defocusing of the background pattern. A third major type of schlieren photography relies on measuring or visualizing shifts in focused images. 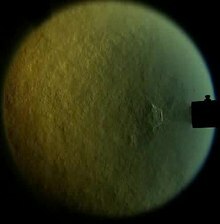 In these techniques, the background and the schlieren object (the distortion to be visualized) are both in focus and the distortion is detected because it moves part of the background image relative to its original position. Because of this focus requirement, they tend to be used for large-scale applications where both the schlieren object and the background are distant (typically beyond the hyperfocal distance of the optical system). Since these systems require no additional optics aside from a camera, they are often the simplest to construct but they are usually not as sensitive as other types of schlieren systems, with the sensitivity being limited by the camera resolution. The technique also requires a suitable background image. In some cases, the background may be provided by the experimenter, such as a random speckle pattern or sharp line, but naturally occurring features such as landscape or even the edge of the Sun have been used. Background-oriented schlieren is most often performed using software techniques such as digital image correlation and optical flow analysis to perform synthetic schlieren, but it is possible to achieve the same effect in streak imaging with an analog optical system. Variations on the optical schlieren method include the replacement of the knife-edge by a coloured target, resulting in rainbow schlieren which can assist in visualising the flow. Different edge configurations such as concentric rings can also give sensitivity to variable gradient directions, and programmable digital edge generation has been demonstrated as well using digital displays and modulators. The adaptive optics pyramid wavefront sensor is a modified form of schlieren (having two perpendicular knife edges formed by the vertices of a refracting square pyramid). Complete schlieren optical systems can be built from components, or bought as commercially available instruments. Details of theory and operation are given in Settles' 2001 book. The USSR once produced a number of sophisticated schlieren systems based on the Maksutov telescope principle, many of which still survive in the former Soviet Union and China. Schlieren photography is used to visualise the flows of the media, which are themselves transparent (hence, their movement cannot be seen directly), but form refractive index gradients, which become visible in schlieren images either as shades of grey or even in colour. Refractive index gradients can be caused either by changes of temperature/pressure of the same fluid or by the variations of the concentration of components in mixtures and solutions. A typical application in gas dynamics is the study of shock waves in ballistics and supersonic or hypersonic vehicles. Flows caused by heating, physical absorption or chemical reactions can be visualised. Thus schlieren photography can be used in many engineering problems such as heat transfer, leak detection, study of boundary layer detachment, and characterization of optics. ^ Burton, R. A., "A Modified Schlieren Apparatus for Large Areas of Field", J. Opt. Soc. Am. 39, 907–907 (1949). ^ Schardin, H., Ergebnisse der Exakten Natur-wissenschaft 20, p. 303 (1942). ^ Goulding, J. S., "A Study of Large-Scale Focusing Schlieren Systems", Masters Thesis, University of Witwatersrand (2006). ^ Weinstein, L. M., “Review and update of lens and grid schlieren and motion camera schlieren”, Eur. Phys. J. Special Topics 182, 65–95 (2010). ^ Settles, G. S., Schlieren and shadowgraph techniques: Visualizing phenomena in transparent media, Berlin:Springer-Verlag, 2001. Wikimedia Commons has media related to Schlieren photography. Grady, Denise (2008-10-28). "The Mysterious Cough, Caught on Film". The New York Times. p. D3. Retrieved 2008-10-28. Schlieren Photography – How Does It Work?